This information is primarily intended for amateur ’ham’ radio operators who wish to maintain and adjust their AT-D868UV, AT-D878UV or DMR-6X2. Any regulatory authority approval (e.g. FCC certification) may become invalid by the use of this information. Users should always ensure that they and their radios are operating in accordance with their licence conditions. In any case, the user alone accepts all responsibility and risk from the use of this information and tools provided here. Be very careful not to accidentally hit the PTT (Push to Talk) button while you have the USB cable plugged in to the radio, or while it is sitting in the charger. Doing so can cause RF to be picked up by the USB cable or charger, and cause damage to the hardware - both radio and charger. This has happened to some unfortunate 868 owners previously. Similarly, keep the radio away from your cellular / mobile phone, cordless phone and wifi devices when the USB cable is plugged in to it. Use caution if writing non standard data to the radio in some of the advanced modifications listed below. It is possible to cause the radio to cease functioning correctly if instructions are not carried out with care. 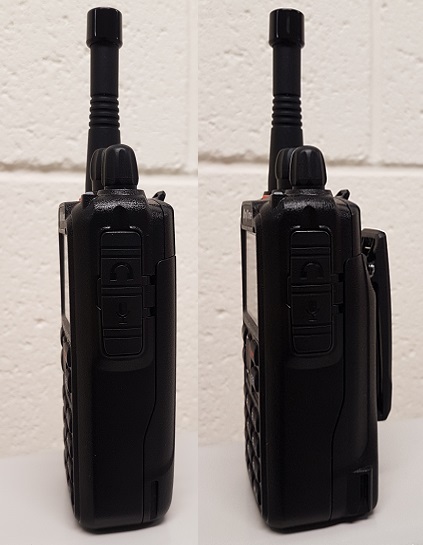 AnyTone’s AT-D868UV & AT-D878UV and its twin Btech DMR-6X2 (unless otherwise stated, I’ll refer to them going forward as simply ’ 868 ’) are excellent dual band DMR / FM handheld radios. They have a fabulous receiver, enough memory to hold the entire DMR user database - for the time being, anyway! - and have many nice features, allowing the user to control just about every aspect of the radio from its operating controls. Perhaps that is why so few modifications have been seen for these models, everyone is happy with them as they come from the factory? Moderate: some skill required in soldering, electronics and/or computing, some disassembly needed. Any self respecting ham / electronics geek will be comfortable at this level. Advanced: excellent soldering skills required, very good knowledge of electronics and/or computing, extensive disassembly. If you have any more information or modifications that you’d like to share here, please contact me at vk7zja at gmail dot com and I will make sure you receive credit for your work, though you are welcome to remain anonymous if you wish. 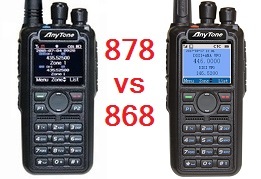 Are the AnyTone AT-D868UV and Btech DMR-6X2 really the same radio? From a technical viewpoint of the hardware, yes they are the very same. The only difference is the firmware loaded to give the DMR-6X2 extra features and some minor differences in the contents of flash memory. 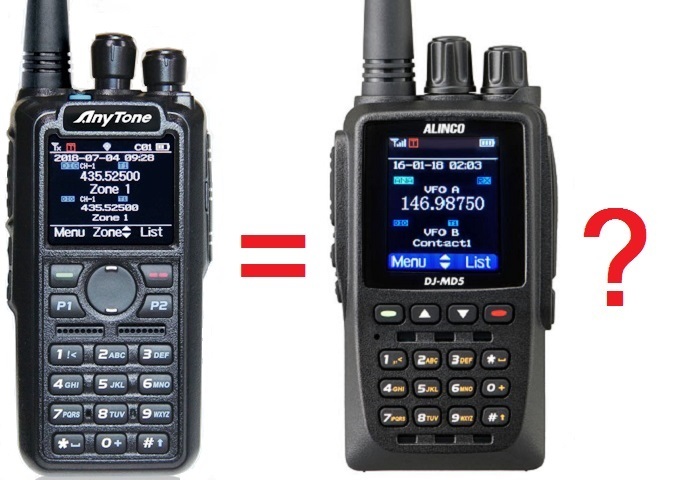 It has even been demonstrated that the Btech DMR-6X2 firmware can be loaded into the AnyTone AT-D868UV. More on this below. What is the difference between the AnyTone AT-D868UV and AT-D878UV? From a features viewpoint, the D878 has some extra features over and above the D868, such as APRS for FM, roaming (automatic switching to a repeater with the strongest signal, intended for large linked networks) and at extra cost can have either Bluetooth or extra audio recording capacity added as an add-in module (these modules / options are not yet available, rumoured to be coming mid-2019). The D878 also has a new screen colour scheme, and talker alias has been implemented. Externally, the only difference between the 868 and 878 is the top mounted PF3 button was changed from orange on the 868 to light blue on the 878. AnyTone also supplied a different antenna with the 878. Second 'V2' revision 868, and 878: identical to the first 'V2' hardware except is now fitted with a GD32F303VG MCU with 1024k of internal flash memory and 96k of SRAM. This revision uses the 'V2' 868 firmware, or of course 878 firmware in an AT-D878UV. You can see examples of this PCB right here at this page below. Despite these variations, you could likely apply many of these hints, tips & modifications across all three hardware revisions and 868 or 878 models. So can you upgrade an AT-D868UV or Btech DMR-6X2 to an AT-D878UV? Yes, this is possible for the second 'V2' revision hardware. I'm not going to detail how the upgrade is done, as that would be unfair to AnyTone and all the effort and support they put in for radio hobbyists. If you are really interested, there is a GitHub topic on the subject. Similarities between Alinco DJ-MD5 and AnyTone 878? 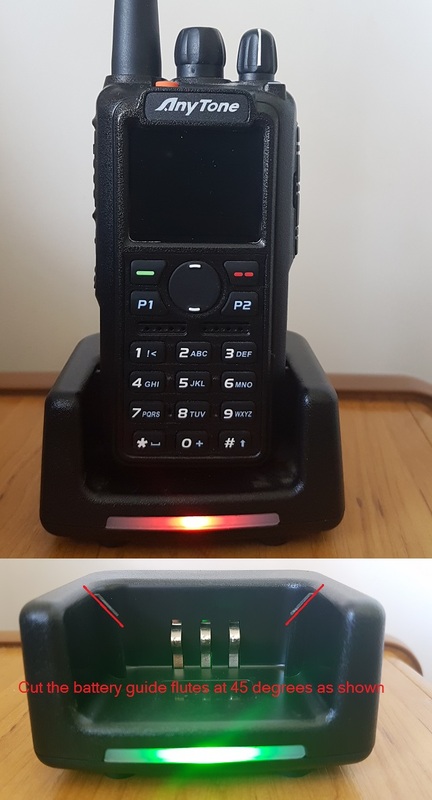 A quick glance at Alinco’s new dual band DMR handheld DJ-MD5 shows many similarities to the AnyTone 878 radio: similar size, similar general layout, near identical display icons, display layout and menus, and the Alinco CPS programming software looks & feels the same as the AnyTone CPS. There are some differences, too: change in case and branding labels of course, more narrow and taller LCD display, no P1 or P2 function buttons, no top mounted PF3 button, and more. 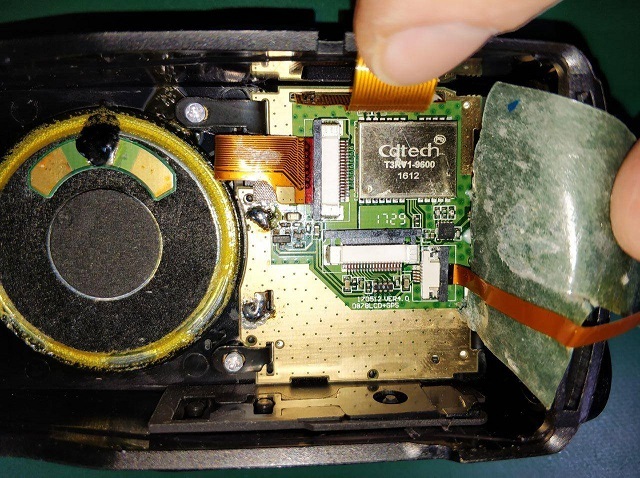 Closer examination of the internals of the Alinco DJ-MD5 from the FCC approval portal at https://fccid.io/PH3DJ-MD5 reveals that the DJ-MD5 and 868/878 are different internally, but that both use the very same major components e.g. MCU, AT1846, RF PAs, DMR DSP, bulk flash memory chip and so on. It appears as if the DJ-MD5 is a redesigned AnyTone 878. To take it one step further, I even downloaded the CPS programming software for the Alinco, and it was able to talk to the AnyTone - it recognised that the model didn’t match, but that in itself proves that the Alinco & AnyTone share the same USB driver, same MCU and same USB communication protocols. When making changes or additions in the programming software, the changes or program additions you made don’t automatically ’take’ when you close the window. You must first select the ’OK’ button then close the window. This has caught me out several times, and though it might seem obvious when reading this, it is easy enough to overlook when slaving over your keyboard. Win 10: Press and hold the shift key on your keyboard and click the Restart button. Select Troubleshoot > Advanced options > Startup Settings and then click the Restart button. When your computer restarts, you’ll see a list of options, press F7 to select Disable driver signature enforcement. Once the computer restarts, go and install the AnyTone driver. Out of date or invalid usbser.sys system file in c:\windows\system32\drivers folder can also cause problems. Find a new version 6.1.7601.17xxx of usbser.sys, and manually copy it into your system32 drivers folder after booting into MS DOS mode, and restart the computer. Some computer’s USB controllers can have trouble detecting the USB connection to the 868 / 878 if the radio is connected via it’s programming cable while turned off, then turned on after the cable is connected. If you find you have this problem, try plugging in the USB cable into the PC while your radio is powered up. Normally that's a big no-no, as you can induce spurious transitions on the USB data lines which can lead to strange things happening. In this case it can result in a successful connection! The working theory is that it is some PC USB controllers might be too impatient waiting for the radio’s USB to respond while it is busy booting up, but if it's already powered up the radio MCU responds quick enough to keep finicky PC USB controllers happy. If you are getting this cryptic error message when trying to read or write to your radio, it means that your PC programming (CPS) software isn't the same version as what is on your radio. For example, in the picture below, this shows v1.09 software trying to interact with a radio with v1.10 firmware. Always make sure you are using matched versions of CPS and firmware. If you see something similar to this next error message, it means you are trying to load a newer codeplug file than what your CPS software version can handle. There are several ways you can correct this issue. Change the MODE setting of the radio to change it’s operational bands. Do this by turning off the radio, then while holding down PTT & 1 keys, power up the radio. Keep holding the keys until you see ’TEST MODE’ on the screen, then release the keys. After the radio has fully powered up, you should see MODE:000xx on the screen. If you don’t, use the up/down buttons until you do. Then rotate the top dial knob to set a new MODE value to match the codeplug you are trying to send to the radio, and simply turn off the radio to set that value. Note that in earlier versions of CPS software, you can look at the menu: Model > Model Information to see what band your codeplug is set to. You also need to know that the MODE shown in the radio menu and ’band’ given by the CPS software do not perfectly correlate. MODE 00 is band 1, MODE 01 is band 2, and so on. So if the CPS software indicates your codeplug is a band 12, then you will need to set MODE to 00011. If this does not work, you can use a hex editor to change the ’band’ that it is encoded with to match the radio MODE number. As above, power up your radio with the PTT & 1 keys to see what MODE number your radio has been set to, and note the number down. Let’s say it is MODE 00015. 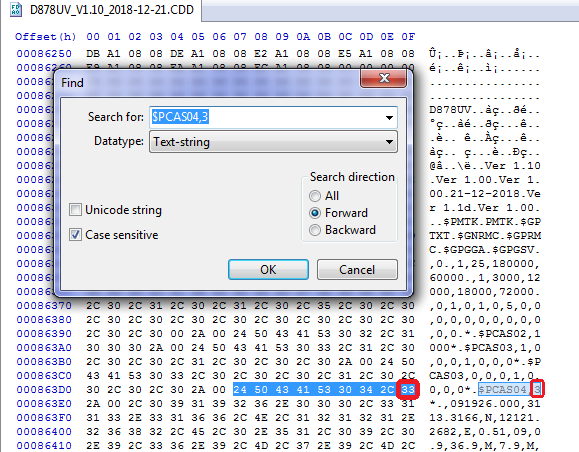 Now open your codeplug .rdt file in a hex editor, and look at the byte at address (hex) 0x0011. This is the byte that tells the CPS software what ’band’ the codeplug is. Convert your decimal MODE number 00015 into a hexadecimal number; 14 = 0F in hex. That is the value you should change the byte at address 0x0011 to. Save the edited .rdt file, and then you should be able to load the edited .rdt file in the CPS software and send it to the radio. Sometimes neither of these methods work. These stubborn cases need a little bit of effort to fix. First step is to load your codeplug in the CPS software, and using the Tool > Export menus, export all to a file and save. Quit your CPS software, and restart it. Connect your radio, and let the CPS software read your radio configuration - even if it is empty. Now you can import everything back into the CPS software, and you’ll need to tweak a few remaining items to complete recreating your codeplug. Finally, you can save this codeplug to your computer, and write it to the radio. While you can load 150,000+ DMR contacts in to the radio, you can’t recall any of them via the radio menu to place a private call to those contacts, and you are forced to dial their DMR ID manually to do so. Sergei has worked out that if you enter the Private IDs you want to be able to recall via the radio menu into the Digital > Talk Groups menu tree in the CPS where you would normally add Talk Groups, adding your desired contacts as a Private Call will make them available from the dial list in the radio menus. Easy! In large menus with lots of selections, instead of lots of up or down button presses to get to the menu item you want, press the P1 button; this will scroll the menu selection down one entire page of selections, allowing you to get to your desired selection quicker and with fewer button presses. The P2 button in menu mode will take you one step back / up in the menu, even if Exit or Back doesn’t appear on the display. If you are deep within multiple selections of menus, rather than pushing Back and Exit multiple times to get to the main screen, you can simply push either # or * once to exit the menus and go back to the main screen in one step. Batteries: the Btech DMR-6X2 and AnyTone AT-D868UV batteries, their chargers and programming cable are interchangeable, as you would expect. Antenna: Any decent quality single band or dual band antenna with a female SMA connection will work on the 868. Speaker microphone: Any of the regular two pin speaker microphones suitable for the usual Baofeng radios etc. will work with the 868. Just ensure the plug is firmly pushed in and seated into the speaker mic sockets. Charger base: The Radioddity GD-77, TYT MD-380/390 and Retevis R3 charger base can be used to recharge the 868 battery with a very minor modification which is detailed further below. Need a spare battery for your AnyTone AT-D868UV, AT-D878UV or BTech DMR-6X2? These only work on the 878 of course. If you have made your own background display image and would like to share it with others, please get in touch with me by email and I will place it here for everyone. It has been found that using enhanced microphone audio (Settings > Radio Set > Enhance Sound > Mic Enhance) causes DMR transmitted audio to be a bit quieter, perhaps by 6dB or more. The recommendation is to leave this setting at normal, unless you have a specific need otherwise. Unlike many other Baofeng programming cables, the 868 cable has no electronics inside, but does need a driver to be installed. 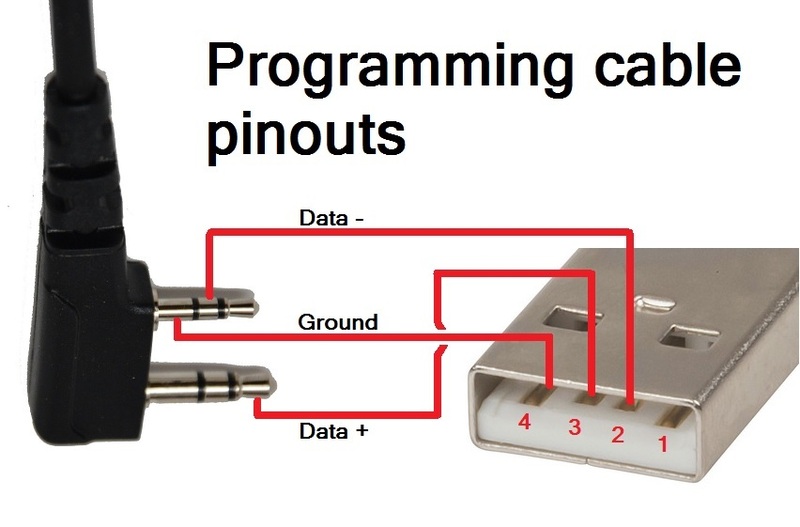 You can even make your own spare programming cable if you wanted, using this pin out as a guide. Thanks to Thorsten DC2ZU for correcting my mistake in the original diagram. My recommendation is to use these power up sequences sparingly, one person has reported his radio now freezes on boot after using the GPS test function, probably due to flash memory corruption while entering that mode. The test mode (PTT + 1) has two levels of access; normally you will only be able to select MODE to change operational frequency bands of the radio, but in full unlocked test mode, some degree of calibration / alignment is possible from the front panel of the radio for deviation levels, power output levels, received signal strength indication (RSSI) levels, squelch levels, frequency fine setting and more. See below for more detail. At the time of writing, there are thirteen, sixteen or eighteen combinations of bands that you can select to use, depending on your radio type & firmware version. Then turn off the radio, which will save your selected mode setting, and from that point on, your radio will use the frequency limits that correspond with the mode setting you selected. You can repeat the process to change MODES at any time. Starting with firmware V1.11 on the 878, fewer MODE options were available to select due to FCC rules governing the sale of radios. This doesn’t mean those other MODES are not actually gone, they’re just not able to be selected. You can still load a codeplug with one of the ’missing’ MODES in a V1.11 878 if you hex edit the band byte from one of the full test mode .CDD files below and send it to the radio to force it to the required MODE number, then load your codeplug. Note that whenever you do change MODE, the radio will reset and you will lose your programmed data. Make sure you have a saved copy of your codeplug. Each saved codeplug will have the MODE it was created under encoded within it. If you try to reload the same codeplug after changing MODE, the CPS software will reject it, saying that it is the wrong band. To fix this, you will need to ’hex edit’ the codeplug rdt file: change byte 0x0011 to match the MODE selected. For example, if you set MODE=00002 then edit your codeplug byte 0x0011 to be hex value 02. Or if you set MODE=00010 then set codeplug byte 0x0011 to hex value 0A. Very Short: for the shortest possible antenna, they don't get much smaller than a stubby 1.5 inch long antenna commonly found on eBay with the model number PHD-601. Unlike most other antennae of this length, the PHD-601 is genuinely resonant at both VHF & UHF; the vast majority of antennae around this length are resonant on UHF alone. However due the extreme short length, don’t expect this antenna to work much better than a dummy load. Strictly for very short range contacts only! Short: many people ask what is the antenna I use as seen in the photo above. That is simply a UHF helical stubby antenna about 2.5 inches long, which you can find very cheaply on eBay. They work very nicely on UHF which is where the majority of my operating takes place, but VHF operation is limited to receive only. This antenna looks quite professional, too. Short no2: for a genuine dual band short antenna around 3 inches long, the HuaHong HH-S518+ stubby antenna works rather well considering it’s short length, but it is completely inflexible so not suitable for wearing on your belt. Just make sure you get the version with a female SMA connection on the antenna. Medium: the best bang-for-buck in the 9 inch long super flexible antenna range has to be Nagoya’s NA-666 antenna. It works as well as some bigger name brand antennae, and being super flexible you’ll hardly notice it when worn on your belt. Long: for a no-compromise performance-is-everything handheld antenna, the Comet SMA-24J is hard to beat. It is also one of the super flexible design types, but at 16 inches long it is impractical to wear on your belt. Whichever antenna you go for, make sure the connection on the antenna is a female SMA. Otherwise, have fun experimenting with different types and see what works best for you. To save your screen plastic lens from getting scratched up, you can buy screen protectors, just like the cell / mobile phone screen scratch protection film, but made especially for the 868 screen. You can find these on eBay. Here is a simple and easy to make adaptor so you can listen to the 868 with normal headphones. You’ll need a right angle stereo 2.5mm audio plug, a stereo 3.5mm audio socket, a short length of shielded audio cable and a 22 ohm 1/4 watt resistor. Connect them up following the wiring diagram below, and you’re good to go. I also filled the right angle audio plug with hot melt glue to secure the connection and give the connector a bit more solidity. By cutting off the battery guide ’flutes’ as shown below, the GD-77 / MD-380/390 or RT3 charger base can be used to charge the AnyTone or Btech radios. The only downside is that these chargers will only charge at a 500mA rate, which means the battery will take twice as long to fully charge as the original charging base would. Here is an excellent video, narrated by Duane N6DMR, on how to disassemble the 868 / 878 / 6X2 radio. It goes on to show how the optional Bluetooth module and it's antenna is fitted, and then reassembly of the radio. If you are planning on getting a Bluetooth module to fit to your AnyTone, you must ensure that it is a second revision ’V2’ hardware PCB variant with the little plastic press fit connector on the PCB, and that you have (or can make & fit your own) a little metal shield over the SCT3258 IC, as not all radios have this shield fitted already. When doing up the screws, first do them up all just a little bit loosely, then after they're all in place go around and do them up snugly, but not over-tight. This is vital to good RF shielding and overall receiver performance. As per the video, re-solder the antenna pin only after you have done the screws up, otherwise the final tightening of the screws and movement of the PCB to snug up to the chassis could place stress on or fracture the soldered antenna pin. To ease refitting of the radio chassis into the case, use a little bit of silicon or PTFE lubricant rubbed onto the rubber seal that goes around the chassis edges. This helps the seal slide nicely into the case, rather than it roll out of place and ’bubble’ up between the gap, especially around the bottom. My personal opinion is that the top mounted LED isn’t quite bright enough to be seen in daylight to see what is going on. After taking the radio apart, it is apparent the tri-colour LED is plenty bright enough, the problem is not enough of that light is making it’s way up the ’light pipe’ to the top of the radio. This was fairly easily fixed by placing some silver reflective tape or paint behind the area where the light pipe is, and pulling the bottom edge of the light pipe so it sits on top of the display PCB. This causes more of the LED output to be coupled in to the light pipe, and as a result it is easier to see in daylight. As delivered by the factory, the 868 / 6X2 covers 136-174 MHz and 400-480 MHz (the 878 already covers up to 520 MHz). 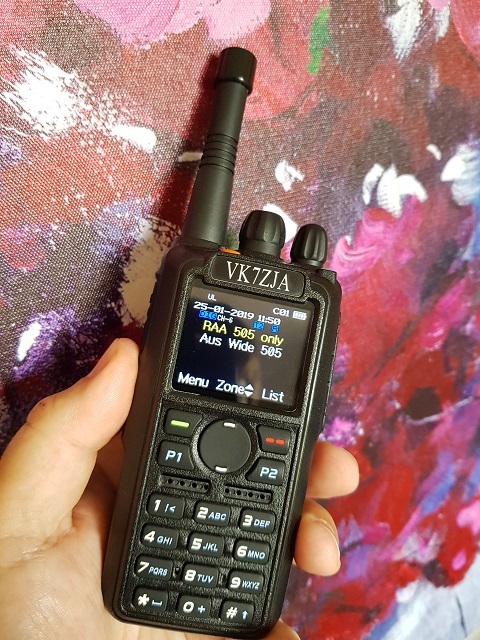 There are countries around the world that make use of the radio spectrum above 480 MHz for two way radio, and this modification will allow you to hear those transmissions. TX is intentionally inhibited in these expanded areas. The modification only opens up the radio hardware, some tricks are still necessary to program out of band frequencies with the software. At the heart of the 868 is an AT1846S ’radio-on-a-chip’ that is designed to work from 134-174 MHz, 400-520 MHz and 200-260 MHz. In practice, the chip will cover even more than that, as you will soon see. Make sure you have saved your codeplug / rdt configuration file first. Using the regular firmware updating software & process, send this frequency expanded firmware to the radio. Power off your radio, press and hold the PTT and number 1 button while turning it on. Hold these keys until TEST MODE is displayed on the screen. Then release the buttons, the radio will power up into a test mode. At the bottom of the screen will be a MODE:0000x display. Use the top selector rotary knob to select whichever mode you want according to your desired TX frequency range from the table below; RX permitted tuning range for all bands (modes) will be set to the same 120-200 MHz and 210-520 MHz for the 868 and 6X2, and 120-290 MHz and 370-520 MHz on the 878. The text displayed on the LCD will not match these expanded limits, refer to the table below which will be correct. Power off the radio. If necessary, update your codeplug / rdt configuration file to be compatible with the version of firmware you have downloaded. If you want to reuse your saved codeplug rdt configuration file, you may need to modify one byte with a hex editor as detailed below in italics. Enjoy actual extra receive frequency coverage of around 127-178 MHz, 190-280 MHz (with a gap between 200-210 MHz on the 868 & 6X2) and 380-520 MHz. Note that whenever you do change MODE, the radio will reset and you will lose your programmed data. Make sure you have a saved copy of your codeplug. Each saved codeplug will have the MODEit was created under encoded within it. If you try to reload the same codeplug after changing MODE, the CPS software will reject it, saying that it is the wrong band. To fix this, you will need to ’hex edit’ the codeplug rdt file: change byte 0x0011 to match the MODE selected. For example, if you set mode=00002 then edit your codeplug file 0x0011 to be hex value 02. Or if you set mode=00010 then set 0x0011 to hex value 0A, for example. Your mileage may vary of course, due to individual radio & component manufacturing tolerances. You can use the VFO and add memory channels to use these new expanded receive frequency ranges. The easiest way to enter out of band frequencies in memory is to use the channel export/import feature of the programming software. Add your desired channel, but program it with a unique frequency in the standard limits, for example 444 MHz. Then export the channels to a .csv file, and edit the channel with a text editor for your desired frequency. Then import the channel, and you’ll see the channel has been updated with your out of band frequency entered. Note that with the expanded frequencies, you can’t enter frequencies via keypad direct entry that start with a 2, 3 or 5 (e.g. any frequency in the 200, 300 or 500 MHz range) the only way to get to them is via lots of knob twisting in VFO mode or use the up/down buttons to tune in 1 MHz steps. To enter out of band frequencies in the CPS programming software, you will need to use the export-edit-import method: program some dummy channels with valid but easy to recognise frequencies, then use the export feature (tool > export > channel > give it a name > export) and save your channels. Then open the saved exported csv file in notepad or similar text editor, find your dummy channels and edit the frequencies as you like. Then use the import feature (tool > import > channel > find your edited csv file > import) to bring the channels with out of band entered frequencies into the radio. But how do we know it is actually working, not just displaying a frequency and nothing else? Conveniently, the 868 has a quirk that will tell you if the receiver is ’unlocked’ and not working at that frequency: program a button as FM monitor, or turn the squelch level to off. If the radio makes a pulsing or popping noise, the receiver is unlocked and is too far out of band to work. If you hear a constant rush of noise, that indicates the receiver is locked and is working as well as it can do. If you have a signal generator, you can test that the 868 is actually receiving this signal, or you can use an off air signal to confirm reception is working. Transmit remains standard according to each MODE. Typically, the receiver locks and actually works around 127-178 MHz, 190-280 MHz (with a gap between 200-210 MHz on 868 / 6X2) and 380-520 MHz, though note that frequencies between 210-400 MHz vary in sensitivity quite a bit. Looking at these plots, the very sudden drop in sensitivity immediately below 400 MHz is due to the frequency tracking front end employed in the 868, and that there isn’t any valid tracking data for tuned frequencies between 210 and 400 MHz. As a result the 868 / 6X2 is very deaf here. The 878 is a slightly different story, though, from firmware v1.07 onward the 878 has rearranged the front end tracking data a little bit, and this has resulted in usable sensitivity around 220 MHz; it’s not fantastic, but enough to hear stronger signals. Hexadecimal - more commonly abbreviated to just ’hex’ - is a system of counting with sixteen symbols. We humans are used to counting from one to ten with our ten symbols we call numbers, those being 0-9. If we want to go above 9, we join two numbers together e.g. 1 and 0 to be 10, and so on. Hexadecimal begins with 0 and goes up to 9, but instead of moving on to 10, hexadecimal uses letters A through to F, so A in hex would be 10, B=11, C=12 and so on up to F which is equal to 15, then hex "10" is equal to 16, 11 in hex = 17 and so on. Once 19 in hex is reached, the next number is 1A. Get the picture? Have a play around with a scientific calculator to convert hex numbers to decimal numbers, and you’ll soon see how it all works. OK, so why hex? As you probably know, computers use digital logic circuits which have just two values: on and off. These can be thought of as a 1 or 0, and computers ’talk’ with lots of 1s and 0s - that’s called binary. For us humans to try and make inputs to a computer in binary with just 1s and 0s would be mind-numbingly tedious, but using hexadecimal is a compromise. You’ve probably heard the term ’byte’ before, and it turns out that two hexadecimal numbers fits perfectly into a byte. So 00, 3A, D2 and FF (all examples of hex numbers) can be represented with one byte of memory. If you were to open a new text document with simply the word "HELLO" in it, and save that text document, you could open the text document in Notepad and edit it at a later time. But that’s not the only way you can edit this text document. By opening the text document in a hex editor application, you can edit the document in it’s raw form as it is stored on your hard disc. What you would see is the word HELLO represented by it’s hex numbers: 48 45 4C 4C 4F. Now lets say you want to change HELLO to APPLE instead. In the hex editor, you would change those hex values to 41 50 50 4C 45, and then save the file. The advantage of hex editing a file is that it doesn’t matter what created the file or what the file contents are, they all get stored on hard disc the same way, and with hex editing you’re editing the raw data and there are no limitations to making those edits, rather than any artificial limits a program might impose. One more thing to know before moving on to your first software modification is to know about the concept of little-endian formatting. Little-endian formatting is listing a value with it’s least significant bytes first. Take a number like 490 for example. First break the number up into two bytes: 04 and 90 (add a zero in front of the first number if it’s not already two digits). Now simply reverse the order of the bytes, so that is 90 04. That is little-endian format of (0)490. Another example with a bigger number: 12345678. Broken up into bytes, that’s 12 34 56 78. Now reverse the order of those groups: 78 56 34 12. Not hard, is it? Little-endian formatting can be equally applied to decimal or hex numbers, simply break the number down into two digit groups (i.e. bytes) and then reverse the order of the groups. The age of hardware expansion modification is over, 99% of the time these days software is the route to achieving results. When looking to make frequency expansion modifications by software, the first step is to see if the programming software can accept, or be tricked to accept out of band frequencies; if you can’t send those frequencies to the radio, then modification becomes a lot more difficult. Thankfully, a lot of programming software only checks for valid frequency entry when entering details by hand inside the software. If you edit a saved configuration file, or import frequencies / channels, often this doesn’t go through the software sanity test. The 868 programming software is no exception to this; while out of band frequencies can’t be entered by hand, they can be imported just fine. The next step is to ensure these out of band frequencies are actually being sent to the radio as intended. For capturing USB data as it is being sent to the radio, WireShark is the go-to tool to analyse USB packets and ensure that the frequencies you want are actually being sent. If the radio accepts and uses these out of band frequencies, you are done and dusted. In the case of the 868, the firmware inside the radio does have a sanity check going on to trap any frequencies that fall outside permitted limits. Where a radio is doing a sanity check on a programmed channel’s frequency, it will compare it against a limit that is programmed in to the radio, perhaps as part of its firmware, or perhaps compared against another memory location. In this case, the 868 has multiple limits stored as part of its firmware. These multiple limits are there to set one of the many options of permitted bands. Things become interesting when trying to find out exactly how the radio represents these limits. One of the essential tools for snooping inside and modifying software like this is something called a hex-editor. BCD - binary coded decimal. 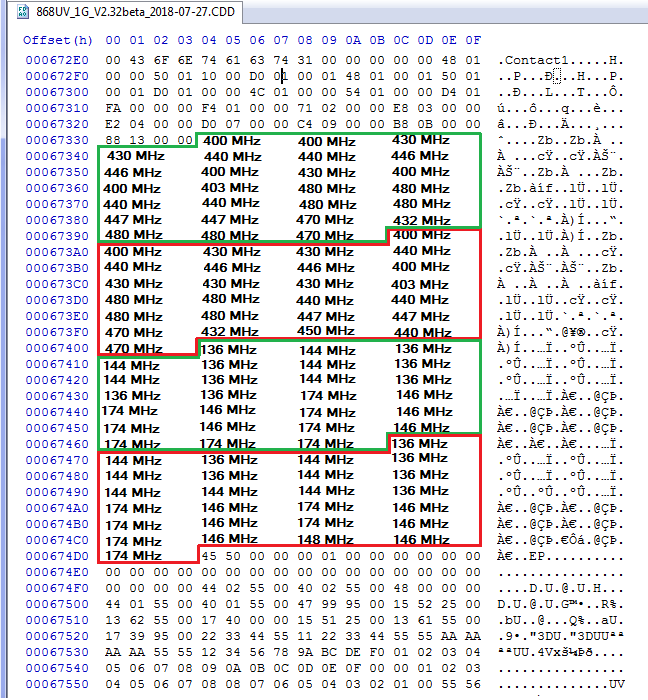 Example: 146.500 MHz might be seen in a hex editor as 01 04 06 05 00 00. That’s quite wasteful on memory, so it could be represented in a ’packed’ form and you would see in a hex editor the following sequence: 14 65 00. The Radioddity GD-77 happens to use this method, combined with little endian format as explained below. Direct hexadecimal notation. Continuing to use the example of 146.500 MHz, if we convert this to a kHz value of 146500 kHz, that is equal to hexadecimal 23C44, or if we break it up into bytes as seen by a hex editor: 02 3C 44. More commonly though, the frequency is represented as a value in Hz, as 12.5kHz step frequencies couldn’t be represented with a whole number value in just kHz. So again using our frequency of 146.500 MHz, that’s 146500000 in Hz. Converting that to hex gives 8BB69A0, and broken up into bytes: 08 BB 69 A0. Other methods that might be convenient to use: it might be feasible to represent frequencies in a form that is directly used by the frequency synthesis hardware. In PLL schemes, this might be in the form of a ’divider word’ that is sent to a programmable divider. For radios using the AT1846S ’radio-on-a-chip’ they receive data in the form of a hex representation of frequency in kHz x16. Yet again using 146.500 MHz as an example: 146.500 MHz is 146500 kHz, and then multiply by 16 = 2344000 in decimal. Then convert to hex: 23 C4 40. It is possible some radios may store frequencies in a form that can be directly sent to the AT1846S. It is also worth mentioning that in most systems, a ’little endian’ format is used, which simply means to give the lowest significant value byte first. If we have calculated our value as 23 C4 40, then the little endian representation of that is 40 C4 23. So you can see there could be a variety of methods used to represent frequency values inside software and firmware, and you would have to search for byte patterns for each potential method. In the case of the 868, none of these methods seem to work, but there is another clue: the .rdt file. After careful examination, you will find that each channel’s frequency is stored as a little endian format hex representation of the programmed frequency in Hz divided by 10. Using our example of 146.500 MHz, converting to Hz gives 146500000, and then divide by 10 = 14650000. Now convert to hex: DF 8A 90. And then finally little endian format it: 90 8A DF. Using this method the 868 stores frequencies in the .rdt ’codeplug’ file, we do get some hits if we search for byte patterns of 480 MHz using this method in the firmware .CDD file. Now it’s a matter of determining which of those byte groups should be changed. Taking an educated guess, we can assume that the thirteen user selectable band limit frequencies would all be stored together in one area. And so they are! We can take another educated guess and say that the first lot of bytes in each group indicated correspond to the first user selection in the MODE: 0000x. Now all we need do is to alter those bytes to our new frequency limit. Let’s try to go for an upper frequency limit of 520 MHz: 520 MHz = 520000000 Hz, divide by 10 = 52000000, in hex = 03 19 75 00, and finally little endian format = 00 75 19 03. We would replace the first appearance of the representation of 480 MHz (00 6C DC 02) with our new limit of 520 MHz (00 75 19 03). Sending this modified firmware image to the radio works! You can now tune the VFO above 480 MHz. But now there seems to be another problem: for some reason the tuning stops at 500 MHz exactly. It turns out there is yet another coded limit within the firmware; it assumes the radio will never need to tune above 500 MHz. We can fix that, too! Performing another search in the firmware for the representation of 500 MHz (80 F0 FA 02) gives just one hit - this must be it. Change that out for our new limit of 520 MHz (00 75 19 03) and now save that and send to the radio. It works! The 868 is now tuning up to 520 MHz. Incidentally, the 868 also has a lower limit for UHF defined, at 300 MHz. In order for the 868 to tune down to 220 MHz, you have to change this limit as well. Change it out for 210 MHz. Don’t try to define a lower UHF frequency limit below 210 MHz as the 868 firmware gets awfully confused and some strange things begin to happen. The frequency expansion for the 878 is just a little different, because the latest firmware incorporates changes to accommodate a different (Chinese domestic?) 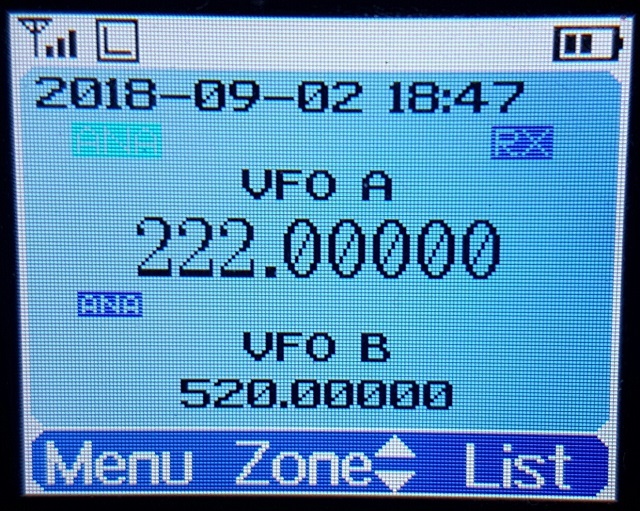 version of the radio with 220-250 MHz, the boundary between VHF and UHF has changed from 200 MHz in the 868 to 300 MHz in the 878, starting with firmware v1.07. This means that the bonus expanded frequencies from 190-280 MHz will be part of the VHF band settings. This actually makes the modification just a little easier as we don't have to worry about crossing hard coded band limits. But how do we know it is actually working, not just displaying a frequency and nothing else? If you have a signal generator, you can test that the 868 is actually receiving this signal. Conveniently, the 868 has a quirk that will tell you if the receiver is ’unlocked’ and not working at that frequency: program a button as FM monitor, or turn the squelch level to off. If the radio makes a pulsing or popping noise, the receiver is unlocked and is too far out of band to work. If you hear a constant rush of noise, that indicates the receiver is locked and is working as well as it can do. Do note that due to the bandpass filtering and front end tracking gain, out of band frequencies between 200 & 400 MHz are not very sensitive, only very strong signals will be heard. As a final note, when a new version of firmware is released, the addresses at which the changed bytes are written are highly likely to change. You would have to do a fresh search for the byte patterns and replace them appropriately in the new version of firmware. The present firmware version 2.34 / 1.10 only permits FM band VFO tuning from 87.5 to 108 MHz. The software however, permits entry of frequencies from 76.0 to 108.0 MHz for memories in the FM band. This is the easiest way to get the 868 to tune down to 76 MHz - put those frequencies into a FM band memory channel. Tuning below 76 MHz isn’t possible at this stage as the RDA 5802 needs to be set up differently to go below 76 MHz. But going up past 108 MHz is possible, - though I’m not sure why you’d want to. Reception of air band transmissions using wideband FM, even with a very strong AM signal, is impossible. But, if you have the need to, I found that my 868 was able to receive test signals all the way up to 121 MHz. Entering such frequencies is quite easy, all you need to do is to enter some ’dummy’ channels, and then using the Tool > Export menu in the CPS programming software, export your FM channels and open the file with Notepad for editing. Change the frequencies of the dummy channels you entered and save the file, then use the Tool > Import menu in the CPS programming software to import your edited file. This way you can enter any FM frequency, in 50 kHz steps, between 76.00 and 121.00 MHz. You can edit and import frequencies outside these limits, but the receiver won’t actually work properly beyond those limits. Would you like to change the display font on your 868, and don’t mind getting your hands dirty with a hex editor and a few other tools? Then do I have a deal for you! Be aware that the bitmapped icons and fonts are vertical raster, not horizontal. It could take a lot of scrolling through the file to identify the font, but the auto step feature makes life a lot easier. In the 868 v2.33 firmware, there are five font sizes: 8x5 H x W (tiny) at 0x06D6F7-0x06D908; 12x10 H x W (medium) at 0x06D921-0x06E1EB; 16x16 H x W (main font) at 0x06E20B-0x06EDC8; and 24x12 H x W (VFO digits) at 0x06EDEF-0x06FB2C. You will also find a fifth and unused super large 24x16 font of numbers and upper case letters only at 0x06FB2D-0x07037E. Other symbols such as the antenna signal meter, battery level meter etc. will be found at 0x07037F-0x070812. Remember, these addresses / locations are only valid for firmware version 2.33, the exact locations will change a little in other versions. Examine your characters that have been imported to make sure they all fit nicely and are fully legible. You can edit the appearance and shift characters up/down/left/right to make them look nice. Rename the extension of your font from a .dat to .bin and you have a file that’s ready to go into the 868. Once you have a binary image of your desired font, you might want to use Colin’s ImageTest application to examine the fonts and confirm how they’ll appear on the radio screen. Now it is simply a case of using your hex editor to copy this binary data from the file you just created over the top of the font data in the firmware file, at the start address you noted earlier. If using HxD, use paste write, not paste insert when copying your new font binary data into the firmware image. Write the firmware to your 868 and enjoy a new look display. For full screen bitmaps such as the start up image, select a width of 128 pixels, height of 160 pixels, select Flip V, select Predefined format of RGB565, and make sure Little Endian is not selected. For other icons you will need to play around with the width and height, but should use the same settings. A few other coloured icons are encoded into the firmware image at locations 0x0708A8-0x07166F (v2.33 firmware), the main one used here is the 11x11 digital monitor speaker symbol. If you would like to experiment with some of the features of the Btech DMR-6X2 (e.g. store & forward repeater) in the AnyTone AT-D868UV, then this simple hex edit hack will permit you to do that. Simply load the Btech DMR-6X2 .SPI file in your favourite hex editor, and shorten it to 14 bytes long. Save it, and then you’ll be able to load that firmware into the AnyTone AT-D868UV. There will be a few icons that are blank or missing, the radio might start up in Chinese language but otherwise it functions fine. Newer versions of the Btech DMR-6X2 firmware causes the AnyTone AT-D868UV to ’black screen’, but is recoverable by reloading AnyTone AT-D868UV firmware again. This is likely due to minor differences in the contents of flash memory between the 868 and 6X2. 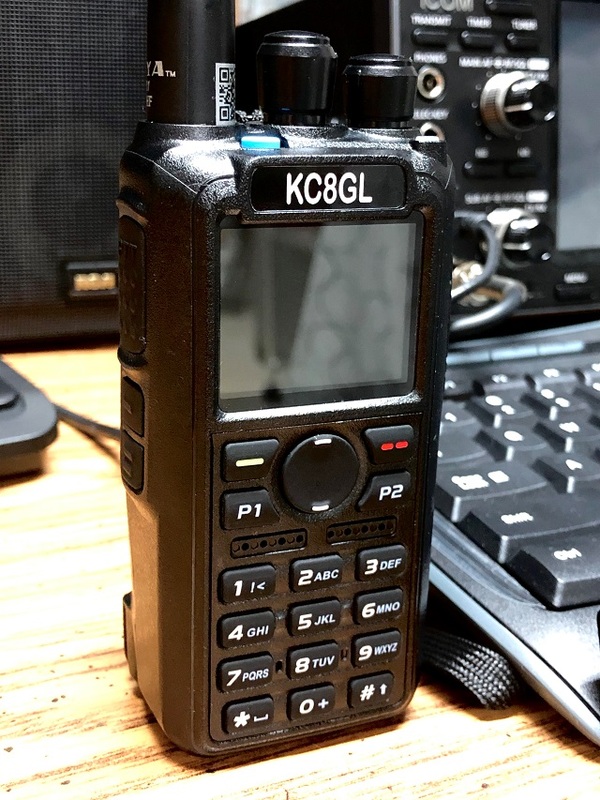 It isn’t confirmed if the reverse is true, that the AnyTone AT-D868UV firmware can be loaded into the Btech DMR-6X2, but I strongly suspect it could be. It is commonly observed that the GPS is slow to lock. The GPS module as used in 868/878 is a dual GPS & BDS (BeiDou - Chinese equivalent to GPS with worldwide coverage) sensor, and it is configured to check not only L1 frequency for GPS, but also E1, E2, E5a, E5b and E6 frequencies for BDS. That is a lot more work for the module to do and explains why it is a bit slow to get an initial position lock. Fun fact: the module is only good to 1854km/h or Mach 1.5! The GPS module uses standard NMEA text strings, and the configuration for the GPS module is sent by the MCU from plain text instructions stored in the firmware. If you use a hex editor to search for the NMEA command text $PCAS04,3 and change that text to $PCAS04,2 for BDS only or $PCAS04,1 for GPS only, you will speed up the time to get a position lock quite a bit, from typically 134 seconds to less than 30 seconds when outside. This also translates to slightly improved lock times when GPS signals are weak such as inside a house or inside a vehicle. Tested with AnyTone AT-D868UV, AT-D878 and BTech DMR-6X2. Warning: you can seriously mess up your radio with this adjustment mode to the point that it may not transmit, receive, or even have a visible display with careless changes to certain values. If you do not know what you are doing, leave this alone. By now you are probably familiar with the TEST mode on the 868, where you can set the operational bands using the top dial to adjust the value next to MODE. There is a way to enable the full test mode menu on the radio so you can not only alter the operational bands, but also things like setting Turbo, High, Mid & Low RF output power levels individually, fine tune the frequency, set the tight squelch values, change the received signal strength S-meter (RSSI) meter curve, even calibrate the battery voltage readout. Begin by connecting your radio to the CPS software and take a screenshot of, or write down the information shown in the ’Local Information’ screen. The process of activating full test mode will erase this information, but if you record it there is a way of replacing it back into the radio afterward. Also ensure you have saved your current codeplug, as activating full test mode will also place the radio into MODE 00000. If you are using another MODE number, then the radio will reset and you will have to change MODE back to the same that you were previously using and reload your codeplug. Unzip your chosen file into a new folder. There are two sets of files in there, one to switch the radio into full test mode, and another to return back to normal test mode where only MODE is selectable. While this step isn’t necessary, if you would like to restore the ’Local Information’ details you recorded earlier, hex edit the .CDD files to enter that information as you require. Most fields are 16 characters long, with the exception of area code of 4 characters, Manufacturer Code of 8 characters, and Maintained Description of 80 characters. Once you open the .CDD file in a hex editor, it will become obvious what goes where. When editing your details back in, ensure you only use standard numbers and letters, and do not use any leading or trailing spaces. Any unused space after your text MUST have the hex codes edited to be 00 (zeros). Spaces in between words are fine however. Save the file and you are ready to move on to the next step. Make sure you have the right COM port selected and hit write, it will only take a fraction of a second to complete. To activate test mode, turn off the radio, hold down the PTT + keypad 1 buttons until TEST MODE is displayed on the radio screen, then let the two buttons go. The radio will boot up into it’s full test / self adjustment mode. If you want to go back to normal, follow the same steps above but select the normaltestmode.spi file instead. Again, sending this file to the radio will overwrite any ’Local Information’ and reset MODE back to 00000, so follow the steps above as shown to ensure everything goes smoothly. For the squelch threshold values, a higher value gives a more sensitive squelch, but no improvement to sensitivity is obtained with values higher than about 112 to 114. Lower values require progressively stronger signals to open the squelch. Once finished changing your values, turn the radio off and on again to save them to memory. If you like, you can disable full test mode by loading normaltestmode.spi in to the firmware / icon updater software and writing that to the radio. The values you changed or adjusted will not be erased by doing this, it simply prevents you from accessing the full test mode and inadvertently changing them again. These values will not be overwritten, changed or restored to default by resetting of the radio. Once you change them, you can not get the original value back unless you wrote it down before making adjustments. Finally, as you go through the adjustment values, it becomes apparent that the 878 (only) has adjustments for the 222 MHz band. Do not attempt to use these radios on that band for TX as the hardware is not designed for it. I suspect the settings are present for a different version, perhaps an Asian domestic version of the radio. Reading data out of the radio flash memory is easy using Colin’s AT Flash Manager software, but if you want to write data, especially to ’critical’ areas of flash memory such as anywhere between 0x02F00000 and 0x02FDFFFF, you will need to use a special technique to do this. This involves creating a CDD file and supporting SPI and CDI files, and sending this to the radio in the ’icon update’ mode (holding PTT & PF2 buttons on power up). This ensures the radio CPU is halted from normal execution while data is being written, and places the radio in a safe mode to permit data to be written. The CDD file is simply a binary image of the data you wish to write - nothing out of the ordinary there. But it is the SPI and CDI support files that tell the radio where to write this data, and how that should be done that is the slightly tricky bit. Apart from the power on password, there is also a hidden programming password that will require a four character password to be entered in the CPS software to do any read or write operation via the USB port. The password must be four characters, no more or less, and can be made up of any standard ASCII characters that can be typed on a keyboard. To do this, you will need to hex edit one of the ’test mode’ files just above and send to the radio. Edit the four bytes indicated in red to set your desired password - in the example here the password is keys shown in red text. If you want to remove this password then you need to edit the hex values surrounded by a blue box to 00 00 00 00 (all zeros). Turn off your clock display and GPS. 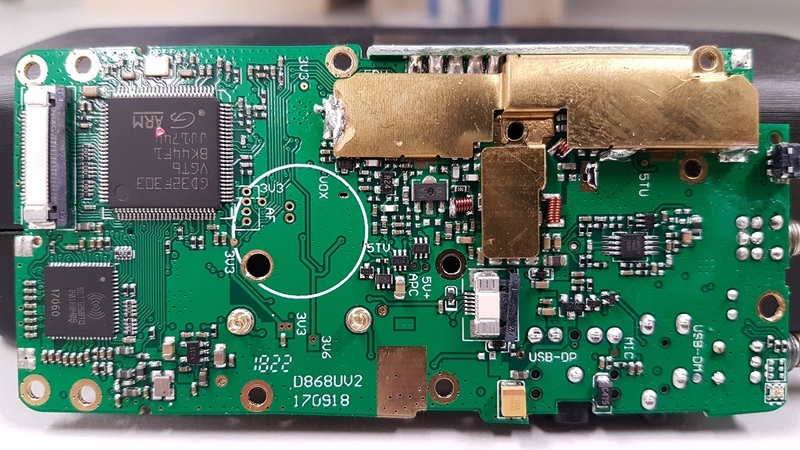 It appears as if any display updates or GPS data that is multiplexed on the data lines connecting the display front half of the radio to the main PCB will cause some interference on VHF. The primary culprit for this is the clock flashing colon between the hours and minutes. Updating to firmware version 2.33 or later can help, as this stops the colon / time separator symbol from flashing. 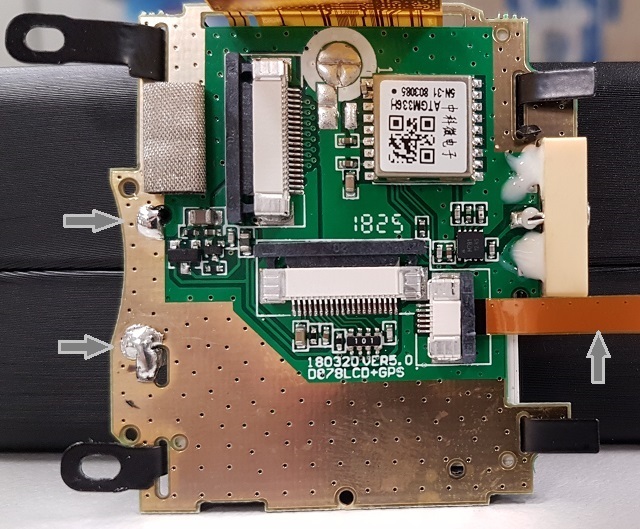 Shielding the small flat flexible ribbon cable with some adhesive copper tape helps a little bit, according to Colin G4EML, especially if you have the older white style flat flexible ribbon cable. It is also essential that you insulate the copper shielding to prevent any shorts circuits, clear plastic sticky tape is fine. If you have a brown cable with no tracks visible on the back side as indicated by the single grey arrow in the picture below, your cable is already upgraded and won’t benefit much from any adding any extra shielding to the cable. Noise from display. Yet more noise appears to come from the LCD itself, and in later revisions of the radio, AnyTone reduced this noise by earthing the metal frame that surrounds the display. You can see this indicated by two small grey arrows in the picture below. If your display doesn’t have this, then thoroughly scrape the paint from the two metal tabs poking through the bottom of the display PCB and solder them to the ground plane as pictured. Use a 60-100 watt soldering iron to rapidly heat the components and solder quickly. Use of a smaller iron will take longer to heat components up which allows time for the heat to spread further, and that isn’t ideal. 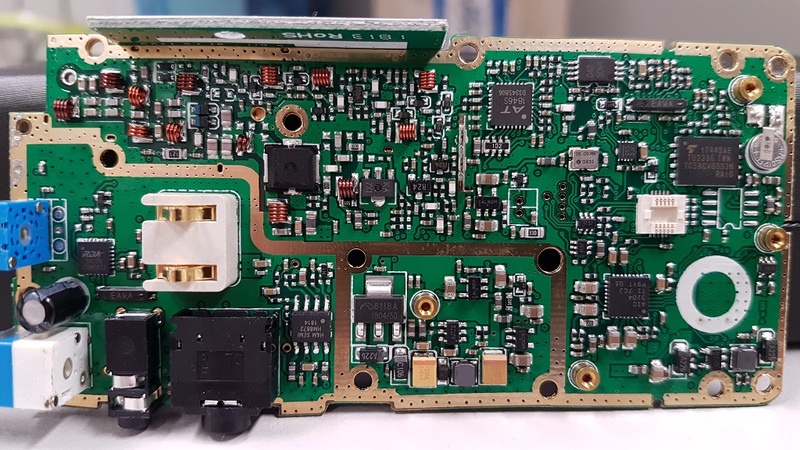 Chassis to PCB shielding: A good connection between the PCB earth and the chassis will ensure the best RF shielding possible. Critical for this good connection, you should ensure that all screws are done up snugly, but not so tight that they will strip the threads. 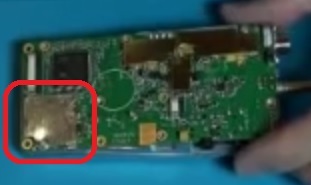 New metal shield over the SCT3258 IC: Appearing in the 878 radio is a small sheet metal shield fitted over the SCT3258 IC, as seen in this screen grab from the Bluetooth module fitting YouTube video mentioned earlier. This shield isn’t fitted to all radios, and it isn’t known if this on it’s own helps with RF shielding. 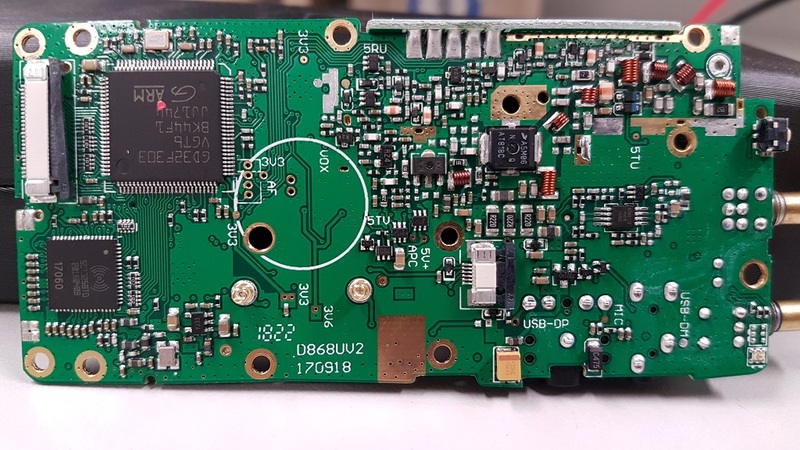 But if you do fit the Bluetooth module, ensuring this shield is in place is vital to ensure the Bluetooth RF transmissions don’t interfere with the operation of the SCT3258, and to provide a physical mounting point for the Bluetooth antenna. I made my own shield out of tin plate. The shield only needs to sit about 1.5mm above the PCB, which allows just enough clearance for components, and a layer of electrical insulating tape on the underside of the shield. Allow a generous clearance around the screw holes at the bottom corner of the radio. Completely disassemble the front half of the radio. You need a bare plastic shell with the LCD display, orange top button and side PTT buttons removed and the plastic ’light pipe’ for the top mounted TX/RX LED removed as well. The speaker and keyboard can remain in place. There will be two ribbon cables coming out of the back of the keypad, don’t try to remove these, leave as is for the moment. Part of the bottom ribbon cable connects to the electret microphone insert. Desolder the ribbon cable from the insert. Use masking tape to cover every surface that you don’t want the nickel spray paint to go. That not only includes ALL the visible exterior parts, but also many interior areas as well. This job of masking every surface you don’t want covered by the paint is fiddly and tedious in the extreme, but is necessary because the spray paint will go everywhere, trust me! Cut out a circle of paper to fit over the speaker and use masking tape to neatly hold it over the back of the speaker. Use a small square of making tape to cover the back of the electret microphone insert. Also cut out a rectangle of cardboard to the same size as the LCD clear display window lens. It is best not to use masking tape directly on the display lens or anything with printing, cover those with some paper or cardboard and hold in place with masking tape over the top. Block up any openings such as the top & side button openings with cotton wool - I use craft work decorative soft balls for this and it works well. You will also need to leave the area around the GPS antenna clear of any coating, so mask up that area on the inside of the case as well, just behind and above the AnyTone label. Mask up the two ribbon cables coming out of the back of the keypad, and cover the little conductive contacts with paper so the masking tape doesn’t leave any residue on these. Use some toothpicks to block up the four screw holes in the chassis, and cut them off so only a little bit pokes out of the screw hole. Finally, also mask up around a slight raised lip on the inside edge of the casing, where the rubber seal seats in the casing. The rubber seal is a very tight fit and you don’t want to make that any tighter from a coating of nickel shielding paint, see the photos to see how this is done. Nickel spray paint is known to be rather hazardous. You will want to do this job outside, and on a calm wind free day. Wear goggles, dust mask, long sleeve shirt and rubber gloves. Place the masked up shell onto a piece of scrap cardboard and use good spray painting techniques to apply a thin coat of nickel spray on the inside of the shell. The spray will look uneven as you apply it, and don’t let that tempt you into applying more paint in those areas. Too much paint will attack the plastic and cause the coating to crack once dried. Let the coat of nickel paint dry, about 24 hours. If need be, apply one more thin coat of nickel paint to cover any areas that were missed or uneven, and let dry for another 24 hours. Slowly remove any masking tape, cardboard protective bits and cotton wool stuffing, and pull out the toothpicks from the screw holes. You should have your same bare radio shell but with a nice grey coating of nickel spray paint on the inside. Reassemble the radio. Don’t forget to wipe over the LCD screen and inside of the display lens with a good quality lint-free optical cleaning cloth before refitting the display board. Combining this nickel spray paint shielding with copper foil tape over the ribbon cables provides the most benefit and greatest noise reduction. Don’t coat the rectangular rubber piece that fits over the side speaker/mic connectors, these must be left ’floating’ from ground. This nickel coating will give an extra 10dB worth of shielding to the back side of the main PCB, which results in a ’cleaner’ receiver, especially in an area of moderate RF fields: weaker signals are less distorted and less disturbed by nearby transmitters in comparison to a radio without this treatment. Note for those planning to, or already have, Bluetooth fitted: the extra shielding offered by the nickel screening spray paint will have a detrimental effect on the Bluetooth signal getting in and out of your radio. Some signal will still leak out, but Bluetooth range will be decreased (by how much remains to be seen). Notice that the 878 approval documents also include details of the Bluetooth module. This Bluetooth module not only uses the Beken BK3260 Bluetooth IC, but also has a Beken BK2452 2.4GHz Wi-Fi IC installed as well, though it doesn’t have an antenna connected. 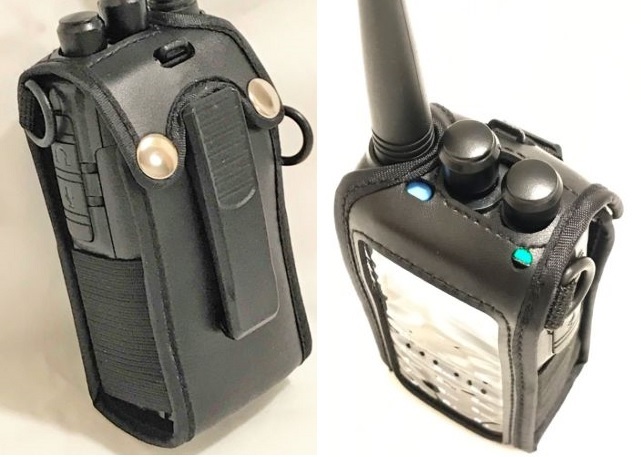 It is reported that the Bluetooth function will allow wireless audio connectivity to the radio so you can use it with a Bluetooth hands free kit for example, for wireless receive and transmit audio and PTT. https://fccid.io/PH3DJ-MD5 details the Alinco DJ-MD5. The back side of the GPS & LCD screen board. Ribbon cables removed for clarity. Note the mini GPS antenna to the right - it sits underneath the AnyTone badge above the display. The GPS module ATGM336H is capable of tracking GPS & BDS (BeiDou) positioning systems. Thanks to Sergey UA3ARF, an alternate version of the GPS & LCD screen board has been identified, this one uses a Cdtech T3RV1-9600 module which is GPS only. The heart of the charger is an unknown IC with markings 5175 and 80501. 5175 appears to be the manufacturers model code, and 80501 is some sort of date or lot code. The following is a list of bugs that I’m aware of with the AnyTone AT-D868UV under firmware 2.33. There may be other bugs not listed here, so it’s not an exhaustive list. Charger constantly flashing red-green-red, even without a battery inserted: charger base has failed. All of these are hardware issues which mean the radio needs to go back to your dealer for attention. Most other problems you encounter can be resolved by updating to the latest firmware version, or correcting problems with your programming ’codeplug’ in the CPS programming software. The 868 / 878 / 6X2 is fitted with a 1 Gbit / 128 Mbyte external flash memory, and depending on what version of hardware, and type of MCU is fitted, the MCU has either 512 kbyte or 1 Mbyte of internal flash memory that holds the operating firmware. 0x08000000 to 0x080FFFFF is mapped to MCU internal flash memory. 0x08000000 to 0x08003FFF used by the AnyTone custom boot loader for firmware updating etc. 0x08080000 to 0x080FFFFF is only available on hardware fitted with GD32F303VG (1024k) MCUs, and is empty on 868s, used by firmware on 878s. Reading the flash is perfectly safe, it is the writing of data that you need to be careful with. Through careless use when writing data, this software can most definitely ’brick’ or disable your radio, or cause hardware damage by writing RF output power values to destructively high levels for example. You accept all risk in use of the software. 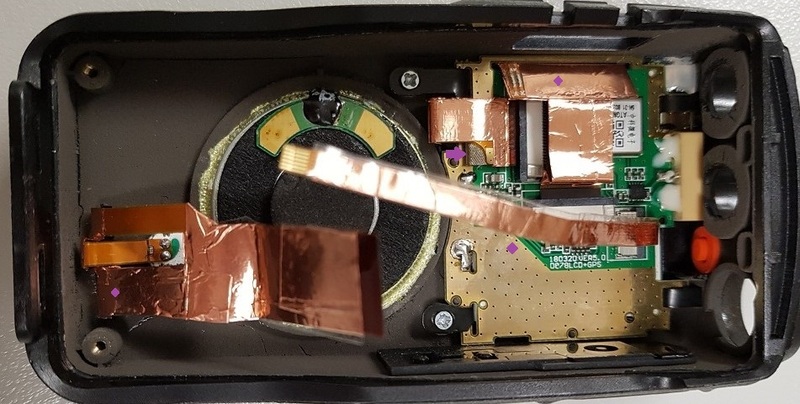 The radio will attempt to prevent overwriting of critical data in certain areas of the flash memory, typically stored between addresses 02F00000 and 02FDFFFF. Do not try to write data in this area by using this Flash Utility software, special techniques must be used. If using Flash Utility to write to the bottom end of flash memory where alternate fonts are stored, you need to apply a 20000 byte offset. For example, if you want to write to address 00000000 you should instruct Flash Utility to begin writing at 00020000. It is unknown why this is necessary, and exactly at what memory address this offset is no longer needed. The minimum block erase size for the TC58CVG0S3HRAIG is 128kbytes, and if you want to edit / write data you should plan on reading in multiples of 128kbytes and edit that block to your requirements and write that back to the radio. This restriction doesn't exist when only reading the flash. If you do want to experiment with writing of data to the radio, it is usually safer to create your own custom CDD, CDI & SPI files for writing a (minimum 128kbyte) chunk of flash memory, using the ’icon update’ PTT + PF2 power up mode. This is also the only way you can change data in the critical memory area between addresses 02F00000 and 02FDFFFF. I *** STRONGLY *** recommend you make a backup of your flash memory contents by reading at least the critical memory area between addresses 02F00000 and 02FDFFFF and saving to a file, and keep that file in a safe location. You can read the entire flash contents from 00000000 to 07FFFFFF if you wish, but this will take several hours to read a 1Gbit flash memory via a serial interface. Flash Utility is compatible with the 868, 878 & 6X2. When reading from the radio, it might be a bit confusing to users to have to specify a file before reading begins - this is the file you will be saving your read results to. Exploiting the capabilities of the TLV320AIC3204 audio codec chip inside the 868. This is a very powerful chip with the possible scope to facilitate DSP noise reduction, equalisation, tone control and digital AGC audio.